IMPORTANT NOTE: The availiibity on these high security padlocks varies. Please call us if you need a next day delivery. Some orders can take around 5-10 working days. We do not retail or cut addtional keys on this model as keys are cut direct by Abloy at designated Centres only. (approx £10-£15 RRP). You will receive a security card with the padlock which is used for key ordering. A link to the Abloy Centres is forwarded with every order. 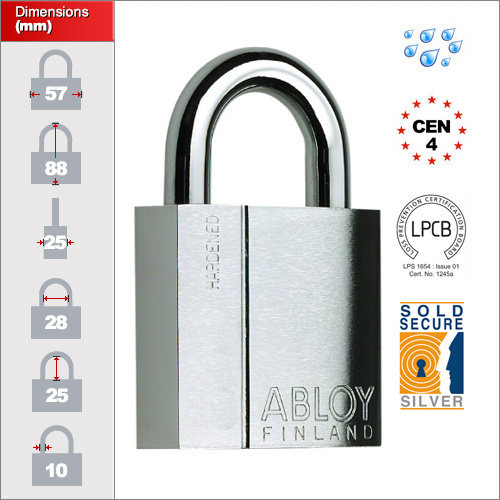 Abloy along with ABUS are one of very few brands to actually research and develop their own designs and locks and innovate the market. Their locks use disc rather than pins also like the ABUS Granit locks and have had proven success over many many years. This also means the keys cannot be copied easily. The locks are solid hardened steel. 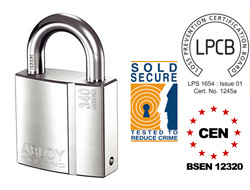 The steel is graded and so will be substantially stronger and more reliable than locks which come from China in brands such as Squire or Masterlock. metal key often used in communications, energy, water networks and other high security applications. The locks can be upgraded to the Protec system if required at additional cost. That is usually used for masterkey and more complex networks of padlocks. The keys are patented and therefore legally protected against copying until 2027 and come with a code card which is used to verify ownership for having more keys or more locks made in the future.